Item #MS-289: Ulexite (the "TV" stone) exhibits an unique fiber optic property. An image is projected through capillary fibers when one polished end is placed on print or pictures. When viewed from the side, you can see the fibers. Approx. 2.5" wide. 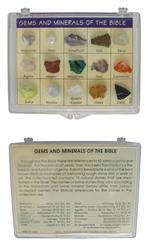 Item #IGM-GMB-12: Gems & Minerals of the Bible Set. 15 piece set of gems and minerals mentioned in the Bible. Each piece is identified. 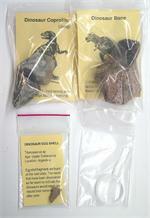 The set is packaged in a clear lucite case. Item #MN-GMD-10: Gibeon Meteorite Dust Pendant on 18" Leather Cord Necklace with Silverplated Brass accent and lobster claw clasp. Item #IGM-EGC-30: Set of ten 1" tall Gemstone Eggs and Matching Stands of Rose Quartz, Fossil Stone, Green Aventurine, Forsterite, Blue Quartz, Orange Calcite, and assorted Agates and Jaspers. Item #MS-896: Approx. 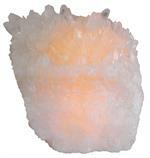 5" x4"x 4.5" White Calcite night light of 5 lbs.